This holiday season I have a great gift idea to share with you that is perfect for that hard to shop for person on your list or for the person that has it all. I want to introduce you to the SodaStream Power, an Automatic Sparkling Water Maker! What a great way to take drinking water to the next level. I HATE plain water and no matter how many times I promise myself to drink more, I just can not do it. The new year is coming and so many of us will be making resolutions that include eating and drinking healthier. There's no better time to introduce a "better for you" choice for increasing that water intake. 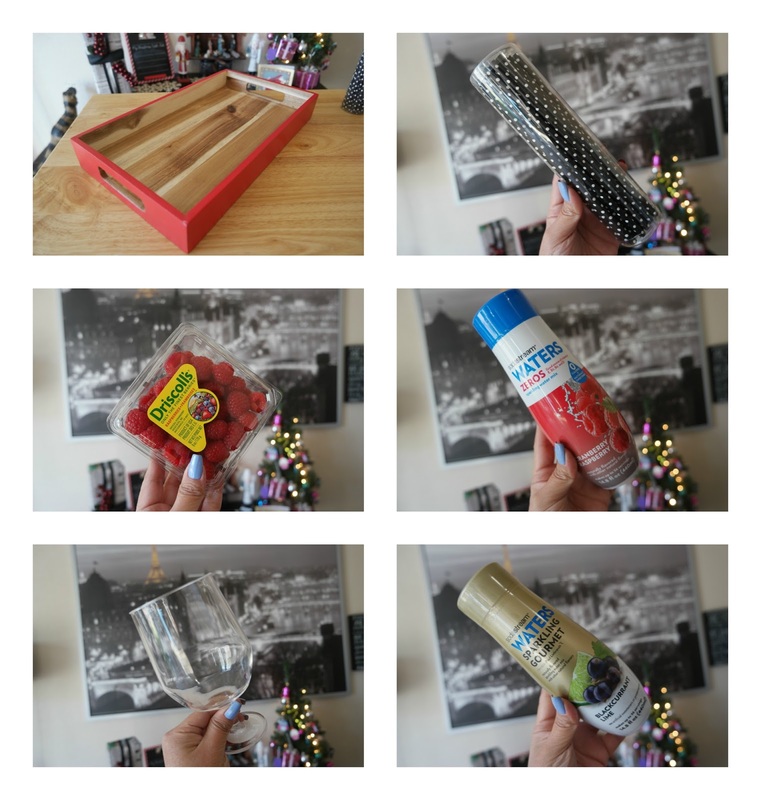 As part of my gift giving guide I want to share a cute way of gifting the SodaStream Power. I love putting a unique spin on gift giving and will usually add something to a gift like this so it's not just a wrapped box, that's not much fun, so I made a little gift tray to go with it that will for sure be a big hit. Putting together a gift like this always gives me an opportunity to really give the receiver something that they can truly use. When it came to the SodaStream Power, I thought of myself and how I like to enjoy drinks at my house. I am a huge fan of trays and found an adorable red one that would be perfect for this gift. I have tons of these trays and find myself using them everyday so I know this is something that will get a lot of use by my gift receiver. Something else that makes every drink special for me has to be a cute cup and fun straw. Lol. These are two more things that I have a lot of at home for myself. I am starting to think that this SodaStream Power gift is perfect for ME! The next thing I added to the SodaStream Power gift are some fresh berries. I love having fresh berries on hand and these are a great addition to every glass of SodaStream Sparkling Water. Last I added two flavors of SodaStream Sparkling Drink Mixes. These lightly sweetened, naturally flavored drink mixes take the boring out of plain water and are low in calories. Now simply add the SodaStream Sparkling Power Sparkling Water Maker and your gift is ready to be enjoyed. The SodaStream Power offers a more convenient solution for carbonating water with touch button activation as well as quick snap-lock bottle insertion. Designed to complement today’s gourmet kitchens with a sophisticated, sleek design. Three fizz levels provide the opportunity for the ultimate in drink personalization. Everything that your gift recipient needs to enjoy a delicious glass of sparkling water is there so they can pull it out and start enjoying! With a large variety of Sparkling Drink Mixes, there will be no getting bored of this water anytime soon. Find the latest SodaStream offers and get free shipping on all orders over $50 at Sodastreamusa.com. I can already see myself enjoying a few glasses of sparkling water a day with a dash of fresh fruit thrown in for fun. No more boring, flavorless water, YO! I really think the SodaStream Power Sparkling Water Maker is a fantastic gift idea. What a way to gift some everyday sparkle into someone's days, especially if they don't enjoy plain water like me. Who do you know that would love to receive the gift of sparkling water this holiday season?